In early 2018, in conjunction with Paolo Pancotti (Catering Manager), we began trialling supplying bulk milk to Hereworth School. Due to the success of this trial we can now offer the same opportunity to Hawke's Bay businesses such as cafés, schools and canteens who use large quantities of milk (in excess of 18L per week). To reduce singe-use plastic milk bottle waste and so to help look after the environment and to support our business model of sustainability. We are aware (as no doubt many of you are too) that many of our customers are looking at and implanting waste reduction plans, particularly concerning plastic waste. In response, we have introduced a Milk Bottle Refill Service which operates from the Origin Earth Cheese Shop. The Milk Bottle Refill Service allows customers to bring in their own bottle/s which we fill with fresh cow's milk while they wait. We also have re-fillable glass bottles for sale. Our offer to bulk users of milk is the commercial equivalent to our Milk Bottle Refill Service – please note due to MPI regulations we cannot have glass in our factory and so are unable supply milk in glass bottles. o the other is with us for refilling. When full each container contains 18L of milk – the equivalent of nine (9) 2L bottles – the extra space allows room for shaking/stirring. We expect you to return the container/s to us clean – but we will sanitise and check for cleanliness before refilling and returning to you. We also have available 2L reusable jugs at wholesale price – it maybe easier for your staff to fill these than use the milk straight from the large container. Significant reduction in single-use plastic milk bottle waste and so a reduction in your overall waste. Slightly reduced milk price per litre. If you would like to take advantage of, or discuss, this offer, please do not hesitate to contact us . Got questions? Check out our Bulk Milk & Waste Reduction Q&A's. Check out the businesses who have made the conscious decision to help us reduce single-use milk bottle waste in Hawke's Bay. Ingredients: Hawke’s Bay cows’ milk. 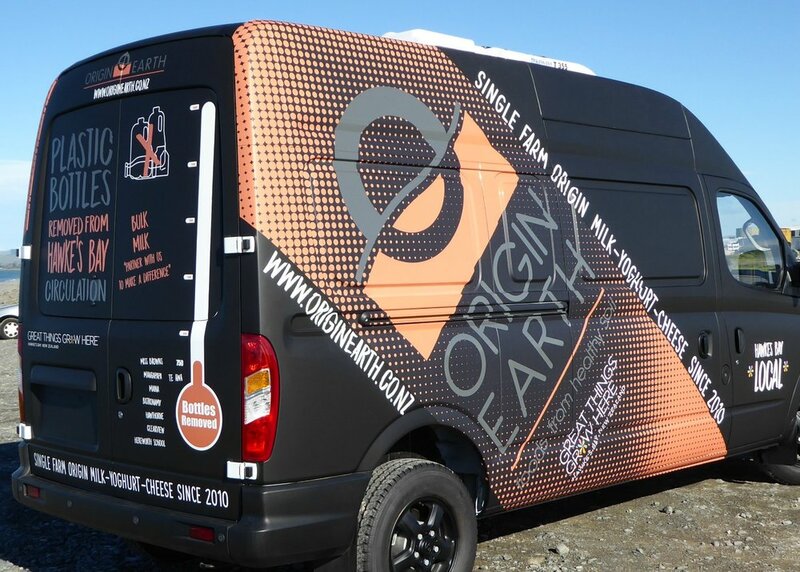 Our multi-purpose van - look for it delivering milk to Our Waste Reduction Partners and at venues such as the Hawke's Bay Farmers' Markets. The list of bulk milk customers who have stopped using single-use plastic milk bottles is increasing all the time.